Arvind Radhakrishnan, Editor-in-Chief of The Bangalore Review (TBR) and Sudeep Reguna, Executive Editor of TBR interviewed the noted writer and Jnanpith winner Prof. U. R. Ananthamurthy at his residence. Arvind: Sir, I thank you for giving us this opportunity to interview you. We have a few questions for you. 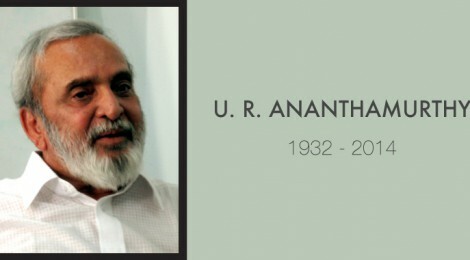 U. R. Ananthamurthy: Sure. Is the recorder on? Arvind: Yes, it is. Let me begin with your initial foray into the world of literature. What was your introduction to literature? Did anyone in your family write? URA: My introduction to literature came from my relatives because in Theerthahalli where I come from and also where our first great poet Kuvempu came from, almost every young person’s desire was to write a poem (smiles). Everyone was a poet. And so as I came to high school, we had one magazine in which I was also involved. It was a wall magazine, where any student could pen what he liked. Arvind: Was this primarily poetry? URA: Yes mostly poetry, also short reports, short stories. Even in the village there were boys who were writing poetry. In those days we had great teachers. We had a man called Yoganarasimhan. He was a musician. He was there in my village high school. And he wouldn’t worry whether we understood it or not, but he would bring a Shakespeare and read a good passage and translate it for us. So, we were exposed to good literature, at a very young age, without understanding it fully. I now see that you experience a poem before you understand it. I may not understand a poem. But I may experience it. That happens with music. That happens with Shakespeare. We were thrilled that we were open to Shakespeare and tried to get as much as possible. Arvind: We were actually having a conversation on a related topic today. Since you mentioned Shakespeare. Tolstoy, a writer you admire a lot, had criticized Shakespeare rather severely. Tolstoy felt that Shakespeare was a over-rated writer. How would you respond to that? URA: Tolstoy was wrong about many things in his old age. He had a terrible quarrel with his wife. And it was a lover’s quarrel because she wouldn’t let him have his way always. And as an old man, he advocated celibacy for everyone. She became pregnant and told the world that Tolstoy is not what you think he is. And Tolstoy himself was a very sensual person. He was a great man, however he turned against himself. Arvind: I think this is evident in Resurrection and his later works…. URA: Yes (nods affirming). He remains a genius even when he tells a small, very ordinary Bible-like story, there is… You know, a moral in all his stories that forces the reader to reflect upon. There was a deep yearning for the ethical. Only Tolstoy could recognize a Gandhi. When you look at this recognition, Gandhi recognizes Tolstoy as a model and Tolstoy recognizes Gandhi as a model. It is a great thing that happened. Arvind: Can you also give us a sense of your literary influences, in addition to the teacher that you mentioned? URA: My first literary influence was from my own language. Karanth [alluding to Kota Shivaram Karanth, a great Kannada writer]. His Chomana Dudi stirred my consciousness, it awakened me because I came from a very orthodox family and it really turned me that I wondered whether the Dalit who came to clean our cattleshed… did he also not have an inner life? He may seem to be very obedient to me. He may seem to be very humble. But he must have an inner life. He must be thinking his own thoughts. That was a great moment for me to think that somebody has an inner life. Somebody as low as a Dalit has an inner life. That was what Chomana Dudi did for me. And, Kuvempu was also an influence. And then, later on, as I became an adult, there were other writers as well. They were also good writers in a way. When I began to learn to read English, I began to read Gorky. Then again, I was attracted to socialism, and Gorky became my introduction to the sufferings of the working class. He opened my eyes to certain realities [smiles in a ruminating manner]. I have read almost all works of Gorky and his “Mother” was very influential. We had our own kind of reading in our days, we used to read a lot of Romain Rolland. Nobody reads him nowadays. Sadly, nobody even in France. But he was a classic writer. I also read his book on Ramkrishna and a book on Gandhi. And then came Tolstoy. We used English not to read Anglo-Saxon literature, rather we used it to read mostly Russian and French writers in English translation [laughs]. We used English always to read what we want. Decolonization was taking place through English because English led us to World literature. It opened many doors. Arvind: How old were you then, when you were reading these works? URA: 16, 17, 18… And I began to publish when I was doing my Honors. Arvind: So, when you studied literature formally, you must have had another kind of exposure that transformed your worldview. URA: Yes. That’s because we had some great teachers. One of them was a very intelligent man. And then, he introduced us to Elliott and Keats. The Romantics were read by other teachers, but we read the non-Romantics with him. And also, that led to many debates. For instance Miltonic language did not allow Anglo-Saxon English. So it became very Latinized. So Keats wanted to give up. And immediately we connected it with a statement made by our first poet, a thousand years ago, Pampa. Pampa says there are two things: one is desi and another is marga… Desi is the indigenous. Marga is the great path and for him, it was Sanskrit. He said that a good poet combines the desi with marga. And that made a lot of sense as I was growing up, any Kannada writer who could mix a right kind of Sanskrit and Kannada became our ideal. So, I developed my prose like that. Not giving up marga, not giving up desi. And that is the greatness of South Indian languages, whereas in Hindi, you won’t be able to see when it is too Sanskritised. In Kannada, I can see it immediately when it is Sanskritised. When it is Sanskritised, it looks pompous. It looks like the words of a very egotistical man. Like you know, in English, anyone who Latinizes English is known as a pompous man. So, we were taught in English schools. Don’t say “I purchased an umbrella”. Say “I bought an umbrella”. I purchased a car. But when it is an umbrella, you must not purchase it. English made us look into our own language for similarities. Arvind: What drew you to a life of letters? When did you realize that you wanted to become a writer? URA: There were many influences and the answer can be a bit complex. I was 18 or 19. But, I wrote all the pamphlets and little books on guinea system and things like that. I was drawn to that and also to literature, to Gorky and others. I had a mixture of friends, some of them political, some also literary. Through that there was an external interest, the socialist movement. [phone rings, it is an abusive caller ]. I get abusive calls. [He calls out to his secretary and hands over the phone to him.] They are stalking me. [Asks the secretary to give the number to police]. Arvind: You were talking about the socialist movement. Arvind: Your thesis was also related to politics. I think it was titled as ‘On Politics and Fiction in 1930s’. URA: Yes. You are right. I met a great man of my age, Malcolm Bradbury, who is dead now and also… Raymond Williams and many others. URA: Yes (nods). Raymond Williams was the leading Marxist literary critic then. I was fully involved in the debates of those times. I had many friends. It was wonderful. The only people who were not political at all were the Chinese students of the Maoist years. I lost all my faith in Communism when I met them. But my reading then was very vast. I read Orwell. I read Hardy. I was reading like never before. Sudeep: You said that you got the inspiration to write Samskara after you went and saw the Bergman movie ‘Seventh Seal’. URA: Yes, yes. That was in England. I went to see it with Malcolm Bradbury (who was my teacher). It didn’t have subtitles. And I also saw this old Christian meeting a – what you call it… maybe – a villager, a simple man who is going in a cart playing little skits for the villagers. He is a nomad. He is not a Christian. And that nomad has a life which this Christian, who goes to fight the Crusades, is deeply affected. That was the moment I was thrilled. I told Malcolm. You in England or Europe in order to create the medieval ages, you have to go back to a library and collect all information. But the medieval times are already there in me. They are there in my mother. I can see and feel the 18th century in my mother and the 10th century in my grandmother. Different times in Europe are simultaneously present in India. As we walk the road, we are simultaneously walking the different times. Arvind: You once said that the Occidental history is like a straight line whereas Oriental History is like a curved line where centuries co-exist. URA: Yes. So that is what I said. Then he said, “you have to write like that”. And then I came back and began to write a story, which I wanted to write for my wall magazine. But I did not write it for the wall magazine. Because what had happened was there was a plague in our town. The doctors came and took care of all of us. They didn’t do the same for the Dalits. And I remember one Dalit girl. I thought she was very beautiful. And she had an affair with a young man from a Brahminical home who had come back from the army. So he had seen the cities. And then, when the plague came and people began to die, she put fire to her hut and ran away. Then, I wrote about this incident. Like the story of Sleeping Beauty. In my story an upper caste man comes and touches the Dalit woman. So I said there is something in the touch. When a Brahmin touches a Dalit and the Dalit woman doesn’t think that she is no longer a Dalit. That there is no difference between me and him. This is touch, not speak. So, touch became a theme for me. So came Samskara. Arvind: You mentioned something about Orwell. Orwell had once said that there is no such thing as keeping out of politics, and that every act is a political act. And he said, in the age of universal deceit, telling the truth is revolutionary. Many a times, I have actually wondered whether you are the Indian Orwell. URA: It is never a easy place to be in. You have to pay a price for it. Now I am abused by everyone [URA had criticized Narendra Modi and he is constantly abused and harassed by Modi supporters to this day]. Even some Kannada intellectuals whom I respected are willing to compromise. They feel that this government will rule for ten years or more. A very well known poet had already written an attack on me, which would please Modi and his followers here. I know that but I am also deeply distressed by what had happened. I said it too. When NDTV 24×7 interviewed me for one of their programs, I said look at the presidential form of elections. Modi goes from one end of India to other end of India speaking Hindi. Hindi is understood in the South, in the North, everywhere. In the South, not very well, but somewhat because Bombay cinema made Hindi popular. And he can win without BJP actually winning. BJP wins because he wins. And if you follow this logic that means no South Indian can become a Prime Minister. In the old system, we used to elect our Members of Parliament. They would among themselves select a leader. Arvind: That’s the legal way to do it actually. The Constitution of India mandates it. URA: That’s how you know Narasimha Rao came to power. Deve Gowda became Prime Minister. Now, it won’t happen ever, if you have a Presidential form of Government. I said this and the BJP MP didn’t say anything. I was interviewed from here. What we are losing is – that regions have their own – federal structure. We are losing the federal structure of our constitution slowly. Nehru respected it, you know. Nehru was himself a mass leader; he was not an insecure person. He respected regional leaders. Now, all the Chief Ministers cant do anything without speaking to the High Command. Everything is centralized. And hence, we are going to lose our constitution, the meaning and true essence of our constitution. So now, I feel I would like to fight Hindi. Hindi as a language is a great language. But imposition of Hindi is not. Non-Hindi speakers will lose out. Arvind: So, it would be a permanent disadvantage. URA: English also should not replace our languages. Arvind: I think you made a point that you would prefer English over Hindi because at least it is a kind of commonality we all share. URA: I said this when Vajpayee was there as an Opposition leader. We had a Doordarshan interview. Vajpayee was a liberal-spirited man, a gentleman. I said that we would all learn only Hindi, if all the Hindi states also learned only Hindi and not English. They learned Hindi and English. They had a double advantage. We had to learn only Hindi. And he said to me, after it is over, you said something which I am not able to say [laughs]. Arvind: One of my teachers in JNU was Prof. Aijaz Ahmed. He is a literary critic and academic teaching at York University in Toronto. He was teaching in JNU for a short while when I was a student there. I recall him mentioning in one of the classes that Hindi is nothing but a dialect with an army. URA: [laughs and nods]Yes that is correct. You know that was what A. K. Ramanujam used to say. Hindi is an artificial language. If you are a Hindi writer, you don’t write in Hindi. You use Rajasthani or Punjabi. One of the provincial languages as the desi and Hindi is the marga. But that marga has to be injected with some desi to avoid the Rajasthan/Punjab dialect. Sudeep: You have written about the difficulties of translations, can you elaborate more? URA: We are always translating. When I come home, I am translating what happened in the office to my mother. And when I speak to my colleagues I will translate what my mother said. In everyday life we are always translating. I think Indians have done it always. URA: No, no, I have made it into a light theory. There are at least three languages in our lives: one is the home language, the other is the street language, the third is the upstairs language. Sanskrit used to be the upstairs language, to communicate with the people from all over India. Shankaracharya needed Sanskrit to communicate. And the street language was Kannada, Telugu, Tamil, to play with the other people and to talk about business, to talk about everyday life, and you happen to have a house language also. If you are a Telugu man, you spoke Telugu at home and Kannada outside, without knowing that you are speaking two languages. Arvind: I remember reading an article where you had mentioned something about Mr. Nagaraj (a great literary critic of Kannada literature) who did not speak Kannada at home. URA: His mother tongue was Telugu. So that is another tongue. I am more keen on the street tongue because a child acquires knowledge from the street as well as from the school. Much of our wisdom comes from the street wisdom. Arvind: I also wanted to know your view on literary criticism in India. In fact, once Vladimir Nabokov, whom both of us have a lot of respect for, in his famous lectures on Russian literature [when he was teaching at Cornell University], stated that “my advice to a budding literary critic would be as follows: learn to distinguish banality.” Would you agree with Nabokov? URA: No differences with him at all. In the good old days, people wrote whatever they wanted to on a palm reed. And they used to be destroyed in 50 or 60 years. Some of them survived. When somebody died, when somebody married, there was a dhaan, gift, some Kalidasa, somebody, would get them to read it. That’s why we have all the manuscripts. In the whole process of time, all those banal things were rejected because it was impossible to keep them in circulation. So, time itself used to do that work. If we say that Kalidasa is a great playwright, I am sure there were a number of playwrights who were forgotten. Time did that work and the cleaning. And today, you can’t burden your students’ mind with a lot of nonsense. If you are a professor of literature, you go to the class. You have a young mind, you want to train that mind. And so you choose a great text over others because there is no time for others. And if you want them to be in touch with popular literature, you will allow some time for them to do that also, but make a list of the world’s great writers. “I don’t want my son to graduate without reading Tolstoy.” Any continuity in a culture happens because of a memory of the past, and if we don’t read Kabir, if we don’t read Tulasi, and don’t read our Hindi writers, what can we do? Take the Ramayan. It is not merely a poetical work. It is a collection of so much of wisdom. It is such a great work, you know. There is nothing like that. So you cant go to it with a strict view of what literature is. But you can read Kalidasa with a strict view of literature. Arvind: I would like to say something in this context. Even though I come from a law school, I have a deep and abiding interest in literature. I talk to lots of people in the literature department. Most of them seem to have an aversion to the classics. Once I met some postgraduate students of English literature. I spoke about Tolstoy and Gogol. Most of them had not read them and some even asked me if I was referring to Google! They are trained to think that this is high literature and they keep talking about other kinds of popular literature. They are asked to move away from classics because reading popular literature seems to be the ‘politically correct’ thing to do. And sometimes I feel that these works they read are very shallow writing that gets passed off as great literature. URA: There should be a certain standard, good taste, an ability to discern. This is what is required of a true man of culture. He should have a knowledge of his own language, knowledge of another European language, knowledge of Greek and Latin and knowledge of India, China, etc. He had to have all this knowledge. China has become very important. So, Orient has come back to the world scene. Arvind: They say it is a very elitist notion. URA: They are wrong. You see England has produced a writer in every locality, in every small place. Even now, our literature is truly urban literature. That was the scene in Europe until Dickens came. They are the geniuses that produced a city culture. Arvind: To a more contemporary question. Do you think India is a good place to practice the arts, be it literature or any other creative arts? And is it really conducive for writers and intellectuals in the current situation? URA: The current situation seems to be rather odd. The only mantra we have is development. Whether it is Congress or the BJP, they all speak of development. But once you begin to worship development it can be a nightmare. The beginning of knowledge is the criticism of religion. If you are beginning to criticize religion, then knowledge begins. Otherwise, everything is in your religion. There is no need for any such pursuit of knowledge. The beginning of all thought is at the beginning of criticism. I would say the beginning of all thought today begins when you critique development. Arvind: So, development is the new religion. URA: Critique development. Gandhi used to critique development. Medha Patkar critiques development. Even politics comes to the critique of development. Obama had to reduce 30% of consumption of coal, due to domestic criticism. You know, the Kannada reading population is higher than the European reading population. So, there is a reading public. Even there if I was to write in English, unless I became a very popular writer, very well known writer, I would take years to sell many copies. When Auden wrote his poems in 1930s, he was a very great poet, but the first 1000 copies would not sell for a very long time. So, there is a constant struggle to replace banality with great literature, that is why you need criticism. Without that there is no literature. And constantly, the discerning community has to be reshaped. Because to discern you should not become an opinionated man. You end up being opinionated. I have an opinion and I don’t change mine. Arvind: Nabokov is sometimes accused of that. He is very hard on certain things. The other thing I feel is that as Indians we have developed a very thin skin these days. A reluctance to accept any kind of criticism. For example take cartooning which was seen as a harmless activity long back. India has a great tradition of political cartooning be it RK Laxman, Shankar or Abu Abraham and many others. Even cartoonists are scared today… even though legally we are a democratic system and so on. URA: You see, now I know how a network of people who are in IT, BT, who are intelligent, they use the technology now. They have lost the ability to accept diverse opinions or criticism. That is the source of intolerance. If somebody believes in God, only Muslims believe in God. The unfortunate thing is that they have not faced any criticism of their religion as we faced with Hinduism or Christianity has faced it many times. But, Islam has not been exposed to that level of criticism. Arvind: Islam is also relatively a younger religion in the context of major world religions. URA: Younger, and also passionate. And also because of what happened in the Palestine… a country is taken away. And in Turkey, a whole country has been forced to follow the diktats of the elite. So, the Muslims have developed a deep complex which is not their own. Arvind: What is your view on religion? URA: I will put it very simply. Gandhi once said all religions are incomplete and hence learn from all religions. A very provocative statement. As science searches, religion also searches. I am very respectful to religions. I am very respectful in prayer and things like that, without believing in any organized religion. I would rather have a religion which doesn’t ask me to believe in God. Like Dostoevsky. When a man is asked “Do you believe in God?”, he is frightened to say yes, because if you believe in God, you cannot have a bank balance. So, nobody believes in God. URA: That was a great insight from a great mind. Sudeep: Can literature ever be truly apolitical? URA: Never. Even a so-called ‘neutral’ person, he is making a political statement when he says that ‘I don’t want to do anything with politics’. Arvind: So one cannot be apolitical? Sudeep: Can it be only an aesthetic appreciation? URA: That can be there. But there will be a political element even in such very direct prose. For instance, Keats’s words, they speak of timelessness and so on. And hence, there were elements of anarchism, which is also apolitical. That anarchism need not be a very positive kind of anarchism. It could be a neutral kind of anarchism. “I don’t want anything to come on me”. “I don’t want politics in my life”. “I am self-governed”. If every act is politics, then there is no freedom to just seeing a bird. In the sense that you can reject politics. To reject politics means to reject statehood, nationalism. Tagore rejected nationalism. Gandhi rejected nationalism. And Gandhi states that there would be a state but a state where the state would do minimum. So do all these great writers. Arvind: Even a mystical poet like Blake, in fact, is political. URA: (nods affirming) Blake is very political. URA: In it he made a great statement against industrialization. Arvind: In fact, even more than Dickens, I feel. Blake preceded Dickens and in those few lines, he was able to capture the sentiment against modernity and industrialization. URA: Remember the lines (from Blake’s ‘London’) on the chimney sweeper… sweep, sweep. It actually sounds like weep, weep. You see these poor children could hardly breathe properly. What a deep and insightful mind Blake had! Such sensitivity too. Arvind: And also the emergence of modernity, in a sense, the diseases and so on in the last lines of the poem. How do you visualize modernity? And what does it mean to be modern in India? URA: I would be very critical of modern world system. But modernism is different from the modern world system. Modernism is being like Blake in his own time, not being taken up by industrialization and all that. He is not bound by the past or the present. So, the modern element is that kind of freedom within a structure, it doesn’t accept something only because it has come from the masses or it has come from a religious authority. Modernism also means to be open to sorrow. There is sorrow everywhere. In every family. They forget it. Arvind: Reminds me of the views of Schopenhauer. He says that life is replete with sorrow and misery and he says that the only recourse for the wise man is to visit art galleries and comfort himself with the beauty of art! Isn’t it a little pessimistic? URA: If it reaches pessimism, you have made it easy.Most optimists are sometimes savages. You have to be aware of the continuity of the dukha element in the human condition itself. So this is modernism. Arvind: One last question. What is your advice to young writers in today’s India? URA: My advice would be: Look within you and write to yourself first. Without venturing into writing to others, think as if you are whispering to somebody very close to you. That makes the young writer to come to terms with his own self. Only then he comes to terms with the outside world. But first is to come to terms with his own self, particularly when they are young. Because your self is everything. You are so totally engrossed with your self. And then to get out of it, you have to become aware of that you were all the while thinking of your self. That happened to Keats. Keats wanted to become a Shakespearean kind of writer, but a highly emotional, inward looking person to become that. So, if you are not an inward looking person, you won’t become a writer. And if you are only an inward looking person, you won’t become a writer. Arvind: Thank you so much for your time. It was an honour to discuss these questions with you.